We are slowly but surely getting there. After some late summer tournaments and preseason matches, European leagues have fired up their regular season schedules. The U20 and U18 crowd have had summer showcases and we had another highly entertaining Ivan Hlinka tournament. Now, many of you are gearing up for prospect drafts. We at DobberProspects feel that the summer months are our busiest so we’re here to help you through process of identifying and procuring the best young talent for your fantasy squads. With that in mind, let’s dive in! Answer: The upside is a seriously dangerous scorer and pure point producer. That’s a darn difficult mountain to climb when you’re 5’9 though, but Abramov has that level of talent. The thing with players his size is he needs a few things to go his way to make it big time. The easiest way is to be an exceptional talent like Johnny Gaudreau. The more difficult way is you need a coach who can absorb the reality that you’ll get outmuscled from time to time and continue to put you out there with legit talent and in prime spots. Being surrounded and insulated by complimentary talent is going to be huge for Abramov because Torts isn’t one to throw rookies into the fire and just accept anything less than perfection. For those multitude of reasons, I don’t see him surprising and making the club, but I do expect he’ll put up some strong first-year numbers in the American league and start to earn more respect at the pro level. Questions: “Thanks again for doing this! Answer: I believe we see Yamamoto push for triple digits with Spokane this season while vying for a WHL title and MVP award. He should also play a key role with the nation’s U20 squad at the World Junior Championships which will limit his games played in the Dub. Heading into 2018-19, and thanks to his 1998 birthdate, Yamamoto will have completed his junior requirements and will be eligible to play in the AHL. That will be a very viable option for the extremely talented winger. He may very well surprise and break camp with the big club as a 20-year-old, but the Oilers should be in a position to be true contenders and unlikely to have the top six job available that he’ll need to procure in order to succeed. Expect him to be a regular member of the Oilers in 2019-20 if all goes to plan. Answer: Timo Meier should get a good long look in the top six at camp and should he display the level of skill that he’s shown in the past, he’ll have a great shot at nailing down a gig. He will, however, be battling with more experienced players who make more money than he does. Mikkel Boedker and his inflated and already disappointing contract will be at the front of the line to redeem himself. He’ll be trailed by Joonas Donskoi, Jannik Hansen and Tomas Hertl. The good news is that there are three jobs up for grabs with just Pavelski, Thornton and Couture being locks right now. Meier impressed greatly with his ability to shoot the puck with regularity despite being a freshman. He averaged nearly 2.5 shots per contest in his 34 NHL games and just a hair under three per night (2.97) in his 33 AHL contests. The former ninth overall selection from 2015 is in a great spot with long-time Shark, Patrick Marleau departing and San Jose desperately needing a youthful impact up front. Answer: I may be being overly harsh here, but Will Butcher doesn’t really deserve to be in the same conversation as the other three gents. In a points-only setting, Cale Makar is the cream of the crop. He carries some risk, something I’ve delved into in a handful of previous mailbags, but the ceiling is sky-high. As for Heiskanen and Liljegren, I personally prefer Heiskanen’s game. He’s a splendid player with terrific processing skills and a full offensive arsenal. He may end up being a more two-way threat than a pure point-getter as the right side in Dallas has Klingberg and Honka roaming around being rovers out there so he’ll be the perfect anchor on the left side. Liljegren appears to fill a hole in the Leafs’ organization as a potential top power play unit right-shot defender and with the talent their building in TO, I may lean Liljegren in fantasy even though Heiskanen is the safer bet. Answer: Terrific question and one I’ve been considering for a few years now. The Flyers have one of, if not, the best prospect pools in the league. Their strength is especially evident from the crease out as their goaltending and blue line crops offer tantalizing real life and fantasy upside. Regarding the defenders, the first thing is to stay away from Samuel Morin. He was a poor pick and doesn’t hold much more upside than a depth defender. Hagg will likely suffer the same fate as a 6/7/8 guy. The next thing that stands out the most to me is the sheer disparity of handedness. As it stands, Philip Myers is the only right-shot rearguard in the system with any value. This immediately gives him a leg up on Sanheim who will play behind Gostisbehere and Provorov on the left side. Sanheim is the player whom I believe will be that guy who is better on the ice than in the fantasy landscape. This imbalance of opposing handed players isn’t exclusive to the pipeline either; Philly has but one right-handed defender on their NHL roster – Radko Gudas, which may give Myers an opportunity to surprise and make the lineup this fall as a first-year pro. Despite being an undrafted free agent signee, the 6’5 Myers is a beast on the back end and displayed that against the very best in his age group at the World Juniors a year ago. He has all the tools to be a major producer on the back end, but of course, he’ll need to find that prime ice first. Don’t sleep on the late bloomer. Questions: “From what I have read, Joey Anderson had a really good developmental camp for the Devils this summer and looked possessed at the World Junior Summer Showcase for the Americans. Answer: I’m a fan of Joey Anderson. Maybe it’s because he seems to find himself as the third wheel on a top line due to his great speed and tenacity, but he can hang when it comes to skill too. He displayed that front-line ability at both the USNTDP and during his U18 tourney where he racked up seven goals and nine points in seven games on route to a bronze medal. After a terrific freshman season at Duluth, he’s going to go back and really start to put the team on his shoulders as a sophomore. As a returnee to the World Junior squad, look for him to be a focal point of the offense, bringing that great skating and good goalmouth ability. His compete level will likely earn him a letter as well. Long term, I think he can become a valuable contributing top nine winger. His game lends itself well to playing in the hard areas, but that’ll only become more difficult as he moves up and with not ideal size, he may run into some issues. All in all, he’s already outskated his draft slot and is looking like a legitimate prospect for the Devils. Answer: The deal with Dahlen for 2017-18 is he’ll come to the Canucks main camp with an eye towards earning a roster spot. That isn’t going to happen. He’s very good and has experience playing in a men’s league, but he’ll need some more refinement and has a very full slot of wingers ahead of him. I do believe that he’s close enough that Vancouver will keep him around in Utica rather than send him back to Sweden with the tantalizing prospect of hooking up with Elias Pettersson for another season. This will afford Dahlen an opportunity to play on the smaller ice, in the more condensed schedule and on a team with a new-found infusion of young talent. If there aren’t a rash of injuries throughout the year, I’d still expect to see him in some NHL games towards the culmination of the season as the team will surely be out of the race and it’s a prime time to give guys looks to help them understand where their level of play needs to be going into the following campaign. A great deal will depend on Dahlen’s upcoming season of course, but the safe bet is to assume both he and Pettersson will join the Canucks full-time to start the 2019-2020 schedule. Questions: “CJD, Thanks in advance. 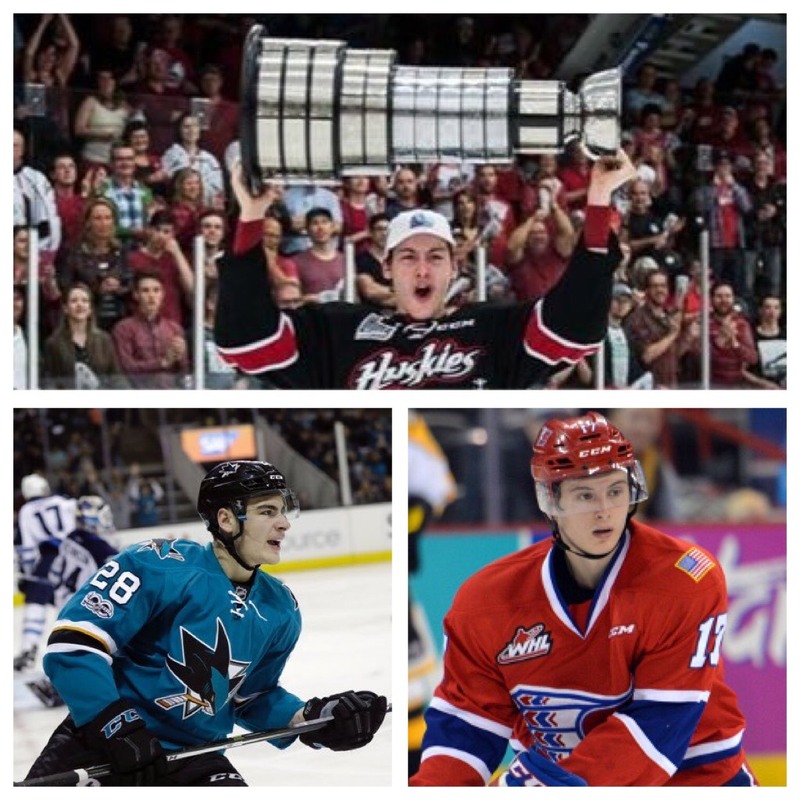 How would you rank these 3 prospects (points-wise) for next year and then again 3 years down the road? Long term: Nylander, Buchnevich, Svechnikov. Answer: Not a ton of pure prospects are primed for top six roles with ample power play time, but there are a few candidates. Clayton Keller is the obvious one, as are Nico Hischier and Nolan Patrick. None of those players have an assured spot, but they should be good bets. Answer: Go ahead and grab any combination of those above-named players. Likely 85 percent of them will stick with their clubs. Toss in Charlie McAvoy, Ryan Pulock and Julius Honka on the back end. That’s all for this month, folks! As always, if you didn’t have your question answered, you can always pose it to me on Twitter @CrazyJoeDavola3 where I’m usually spouting off some sort of hockey-related take daily.